With our city's landscape changing so rapidly, both the physically and digitally, HomeCity Real Estate has recently updated its website, www.homecity.com. It has done so to ensure the highest quality user experience possible and streamline the home search process for its users. HomeCity 2.0 still has all the same features, but is packed with many more, all with a new streamlined, sleek look. 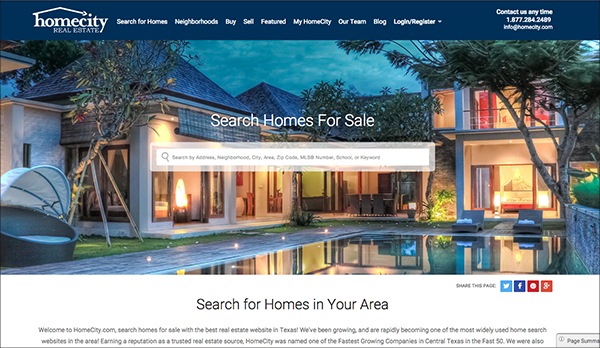 HomeCity is a local brokerage, whose website is one of the most widely used home search websites in the Austin area with thousands of visits per day, and tens of thousands of registered users. Unlike websites like Trulia and Zillow, their website hosts all MLS listings which are completely up to date and refreshed every few hours. HomeCity has added different clickable maps to make a home search easier including an interactive map, a city/area map, a school district map, a zip code map and an MLS area map. The system will continue to allow users to search for properties with its attractive, easy to use but advanced interface, as well as setup 'saved search' parameters so users can watch the market in any of the neighborhoods they are considering. The improved universal search bar allows users to search from almost any page of the website, and searches property descriptions for specific keywords. For example, if a user types in "hardwood floors" all listings with 'hardwood floors' in the description will appear. Additionally, users now have the ability to filter listings by how long they have been on the market and by their status. Currently, the status options available are Active & Active Contingent. Plans are in place to add Sold listings. New social share buttons are also present on each page allowing anyone to share any page, listing, or blog article with their social networks. Another major change to the website is the use of tabs on listing, neighborhood, and city pages to display information in a cleaner, more easy to find way.